Blogger vs Blogger (BvB) is a new Label/Category of Foodiotkk.com. BvB will feature write up or activities held by bloggers / for bloggers on foodiotkk: BvB works as a humble platform to promote fellow bloggers' project, it could be a collaboration, a community project, or simply some bloggers' work! Sky's the limit! It is inspired when creative art blogger - Kendy Kun (kendylife.blogspot.com) contacted me to feature in his latest project: Hello Sabah Month. Kendy Kun is a Sabahan blogger, a creative artist, a Mangaka, a photographer.... and many hats that he yet to reveal to me! HAHAHA!!! Let's check out his "Hello Sabah Month" project dedicated to Sabah very own harvest festival - the Tadau Kaamatan which held on the 30 & 31 of May! 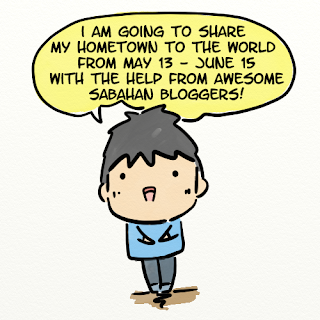 Kendy will write about and doodle the featured Sabahan blogger, on a staggered basis, during the whole project run. 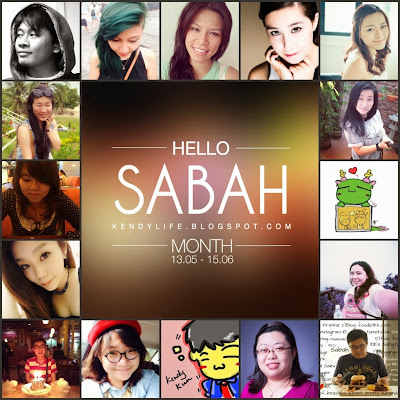 "Hello Sabah Month" project's first featured blogger is Leanna Chong - who run a photography & travel blog. Kendrick, nice project and hope more people see what is happening in Sabah!